European Commission President Jean-Claude Juncker (L) arrives with British Prime Minister Theresa May before their meeting at the European Commission headquarters in Brussels, Thursday, Feb. 7, 2019. Manifestly, the Brexit process is not going well or smoothly at all. 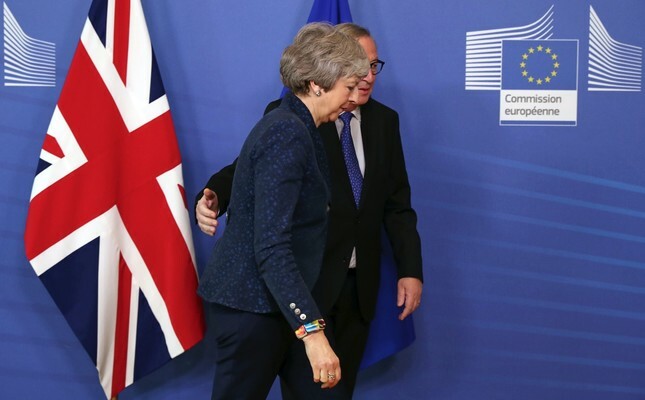 There are two obviously opposite understandings of the situation: The U.K., led by intransigent premier Theresa May, is betting on the opportunity to get a better deal from the EU 27 at the very last minute. It is almost customary to see the EU governments effectively produce last minute arrangements when things go sour. Just remembering Poland insisting on having the same number of votes as Spain before its membership at the Nice Summit is eloquent enough. Poland won its case after having delayed the historic summit for three additional days back in the year 2000. So seen from the perspective of historical developments, the U.K. has a point in thinking that until the last signatures are dotted at the bottom of the page, there is still room for maneuvering and getting a better deal. On the part of the EU, this "negotiating strategy" by the U.K. is well-known and mostly dreaded. It is a fact that since 1973, the year of its membership, the EU has been almost continuously challenged by the British diplomacy, which carved a sui generis niche within the EU for itself. Starting from the common EU passport standards, through the Social Charter, the euro and finally the rebate granted to the U.K. for its participation to the EU budget, the U.K. has always had special demands. Therefore, the EU 27 are well prepared to present a united front against the "last minute arrangements" asked for by the U.K. Attempts by the U.K. to divide and dismantle this united front have been in vain up to now. The U.K. is practically the only country having organized a referendum on membership just after having joined the EU. In 1975, the campaign "Keep Britain in Europe" was successful and the U.K. remained a member of the EU. It is worth remembering because it was the end of the "glorious 30" and the beginning, with the 1973 oil crisis, of a new period with inflationary pressure and heavily increased unemployment. This "one foot in, one foot out" strategy of the U.K. has been mostly successful for decades due to internal and external dynamics. Internal dynamics, because starting with Germany and the Netherlands, nobody wanted the U.K. out of the EU, so many exceptions were accepted to keep Britain in Europe. External dynamics are chiefly due to the reunification of Germany after the demise of German Democratic Republic. At the time, German Chancellor Helmut Kohl accepted a very challenging objective to bring the six Länder and East Berlin to the same level of development as the rest of Germany in two decades. Nobody within the EU could possibly oppose Germany's approach, which resulted in very low growth for almost 20 years within the EU. The U.K., in the meantime, took advantage of its particular relations with the U.S. to secure a better growth and unemployment rate than the EU average. This development has consolidated in the minds of the euroskeptic elite that the EU would be better off without the U.K.
May is neither Winston Churchill nor Margaret Thatcher. The U.K. is in no position to dictate its own terms, whereas the EU is. There have been a lot of occasions where the comparison between the U.K. and Turkey were made, thinking that an unnamed second-tier system could be established with the EU, at the westernmost and easternmost sides. I do not know how such a sorry international development can be called a "system of integration." Having participated in the development of the EU-Turkey relationship for the last 30 years, having acquired a bit of proficiency in the history of these relations, I can bluntly say that such a framework of relations should not be taken as an example for anybody in the world. It can be seen as a good example of "what not to do," but that is all. Turkey and the EU have had long periods of glaciation, punctuated by short periods of deepened cooperation. In spite of all its efforts, Turkey never had one-fifth of the support from the EU as some Central and Eastern European countries had. On the other hand, the customs union between the two partners did not really change Turkey's democratic and administrative structure, let alone the positive development of the judiciary. Therefore, after 55 years of increased cooperation, the result economically speaking is acceptable. Seen politically, it is a total disaster. In the absence of good interpenetrating political and social ties, the economic integration lags behind. This is the main lesson to draw from the EU-Turkey relations in more than half a century; this should sound as a warning for the U.K.